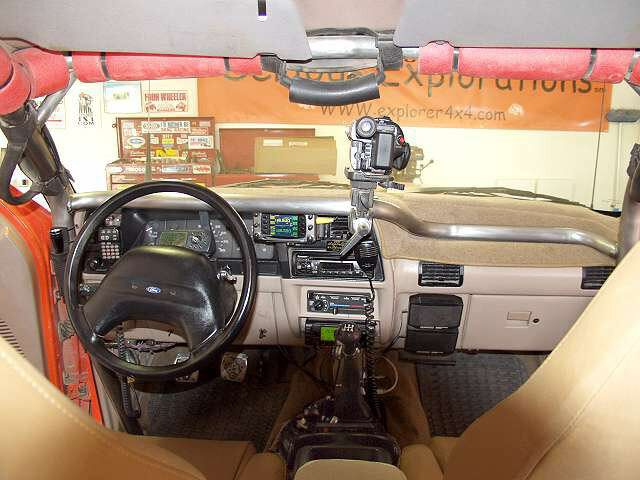 After 7 years and 140,000 miles I decided it was time to make some major changes to my already capable Explorer. 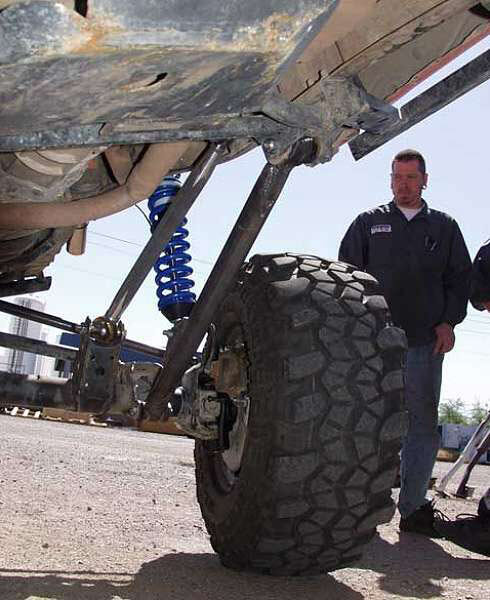 During this round of mods FST scrapped the stock Ford TTB (Twin Traction Beam) suspension in favor of a solid Dana 44 front axle and accompanying custom 4 link suspension. 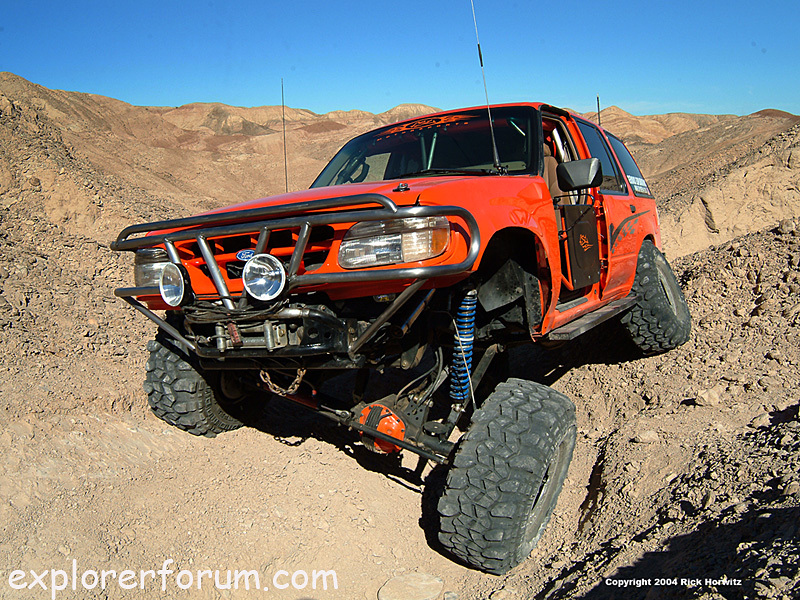 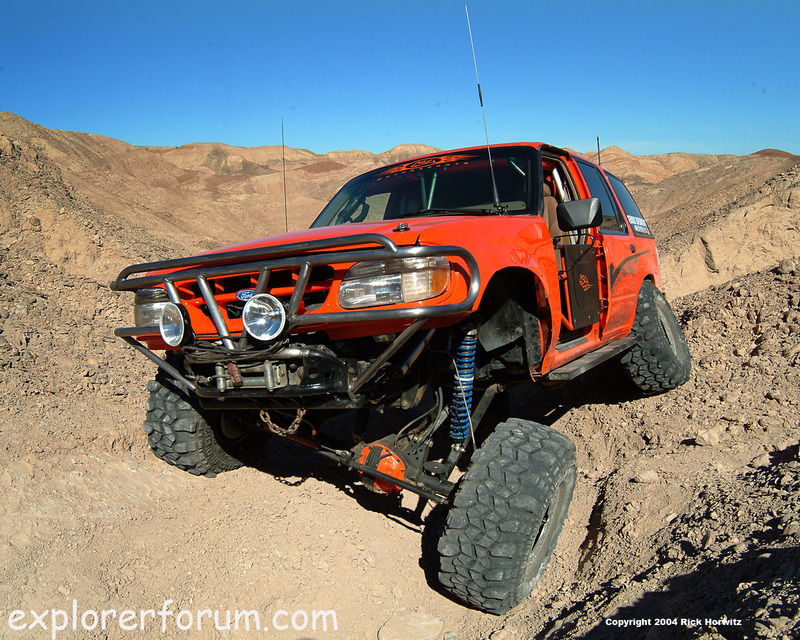 The Dana 44 carries an ARB Airlocker with 4:88 gears as does the Ford 8.8" rear axle. 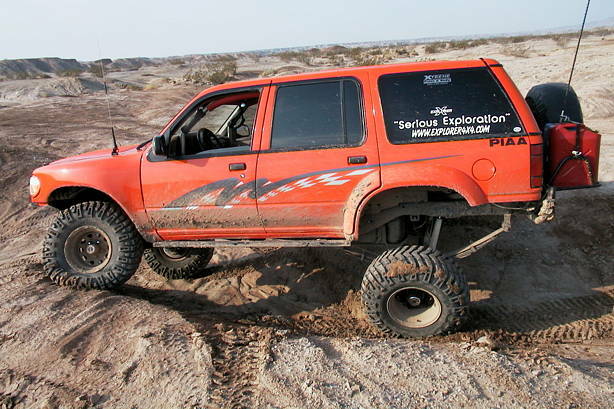 36x14.50 Swamper IROKs were added to 15x10 Trail Ready beadlock rims and the appearance of the truck was freshened up with the addition of a 1999 fiberglass front clip from Perry's Fab & Fiber and a bright orange paint job from Extreme Paint and Body of Scottsdale, AZ. 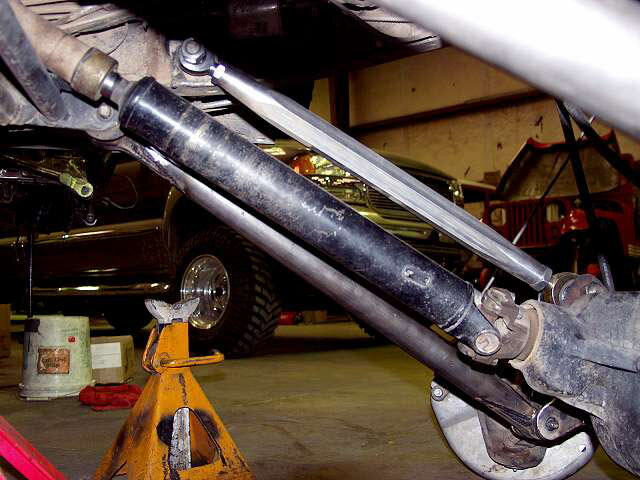 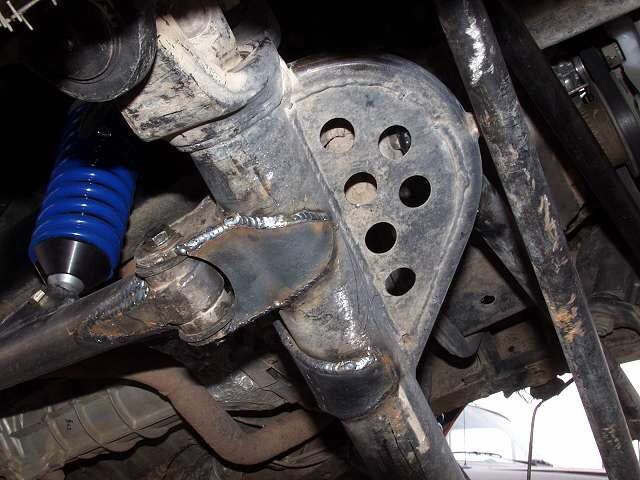 The Dana 44 used in this application is a high pinion design which works well to keep the driveshaft out of harms way and to keep the working angles to a minimum. 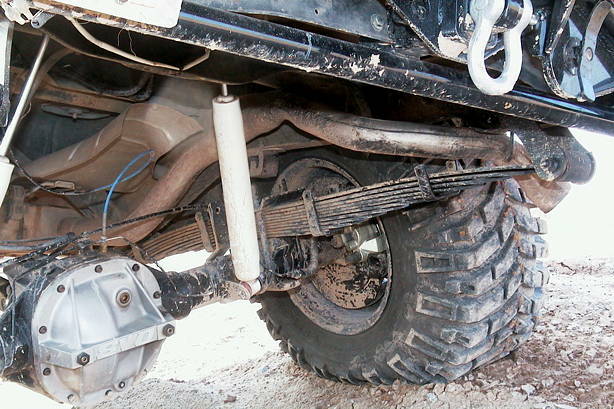 The axle housing was purchased from Tri-County Gear. 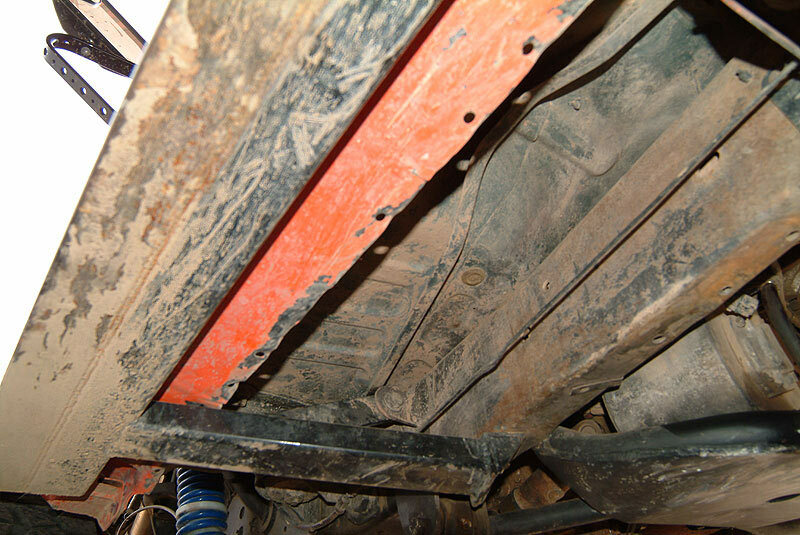 They pressed in the tubes and cut them to size, the track width is now 2" wider than stock, 1" wider on each side. 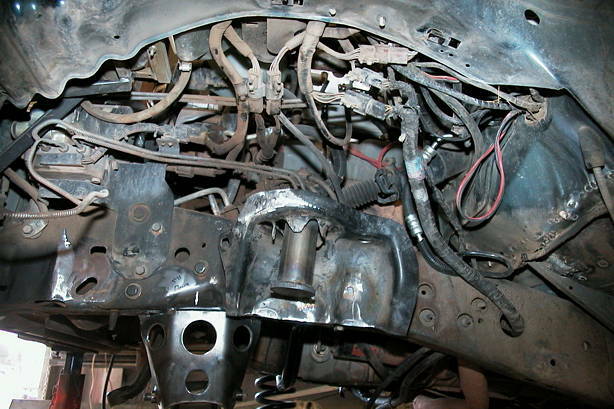 The brake calipers, spindles, hubs and rotors are from a 1980 Blazer. 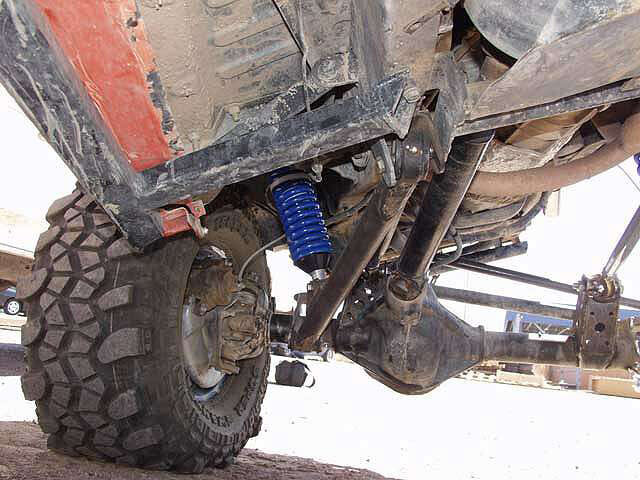 The parts are readily available and relatively inexpensive. 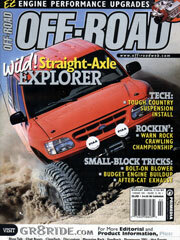 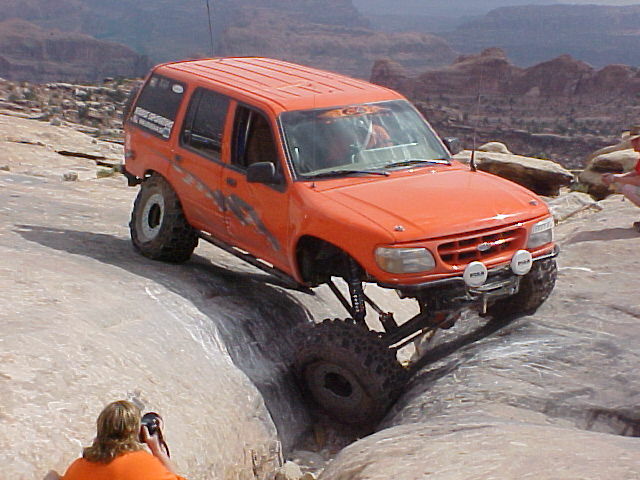 The anti-lock brakes no longer function, but in my opinion that is a very good thing for an off-road vehicle. 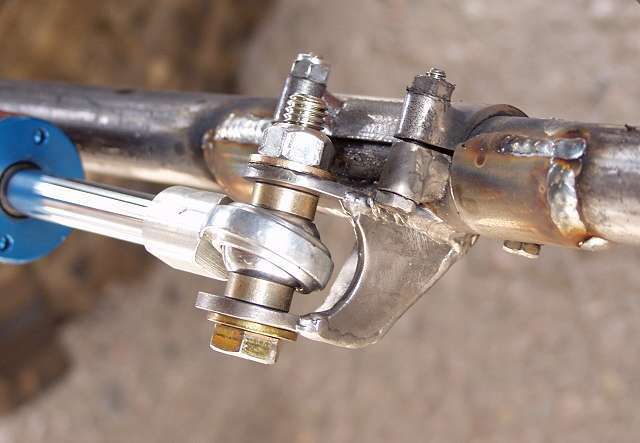 Stopping power is very impressive with this setup. 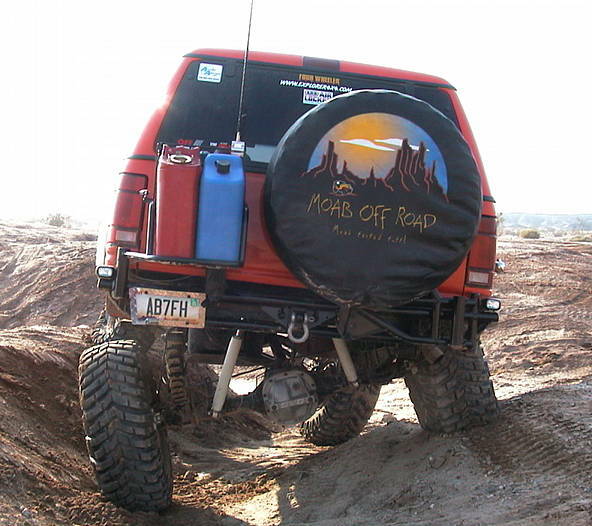 Axle shafts are by Moser and front axle u-joints are by CTM, hubs are by Superwinch. 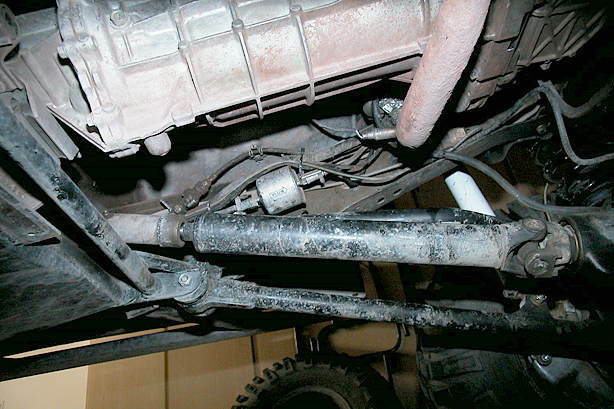 This Dana 44 has now been under the truck for 5 years. 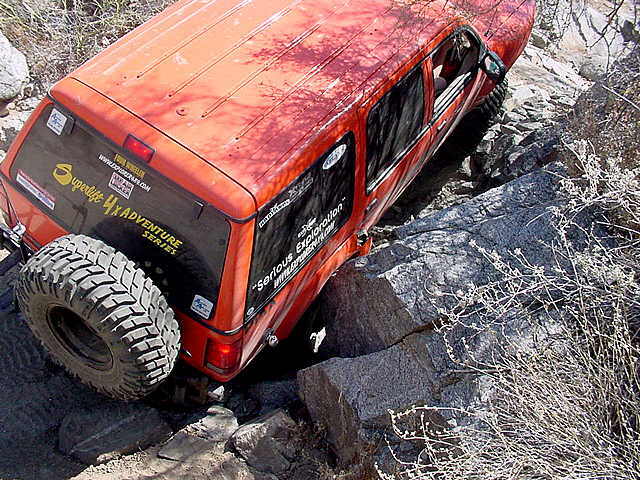 In that time it has seen a ton of abuse thrown at it by trails like the Rubicon, Golden Spike, Hells Revenge, Terminator, Judgment Day and many more. 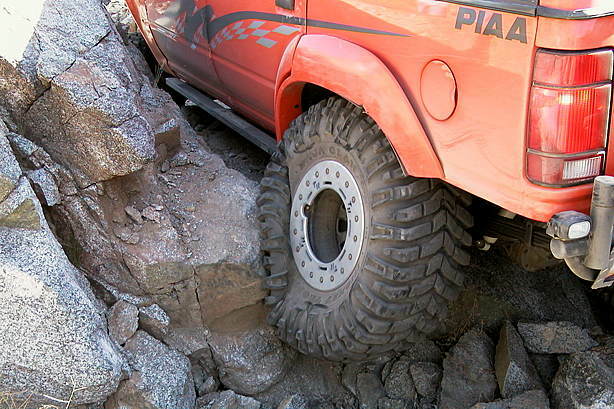 The only breakage has been a blown hub. 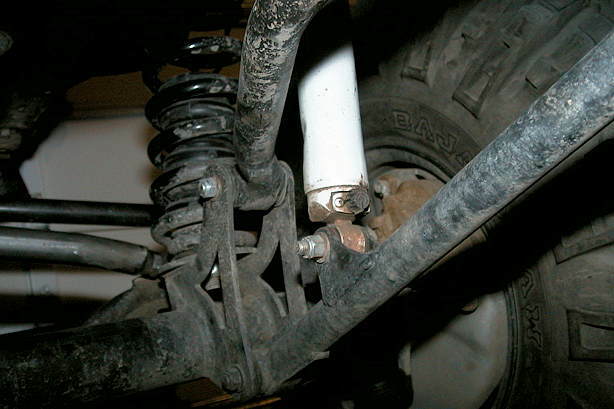 The ball joints were just replaced after 5 years all 4 were badly worn. 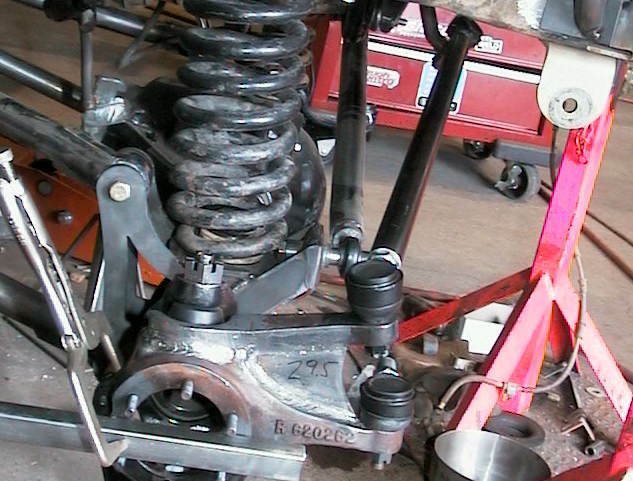 Spring is allowed to droop freely. 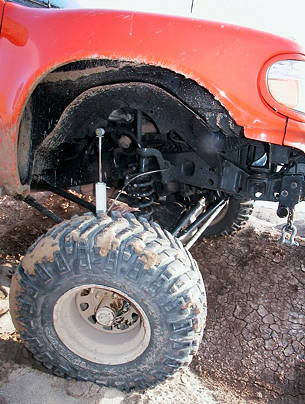 Rear radius arm attachment points. 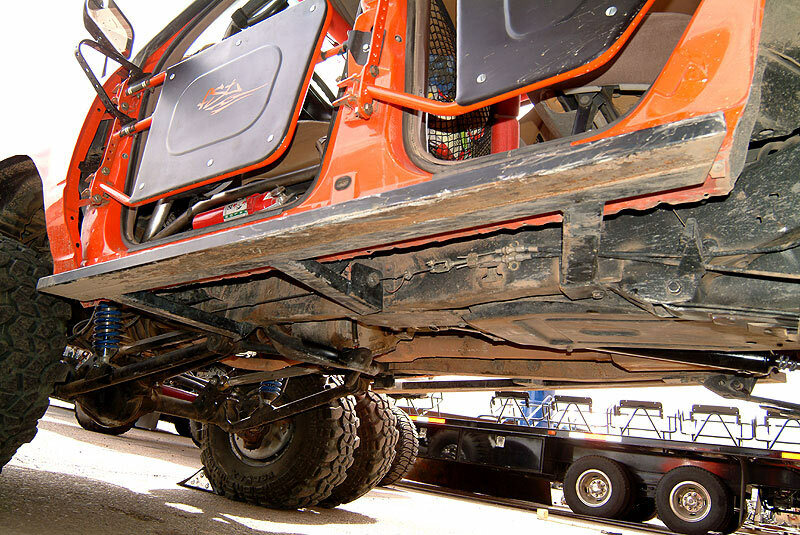 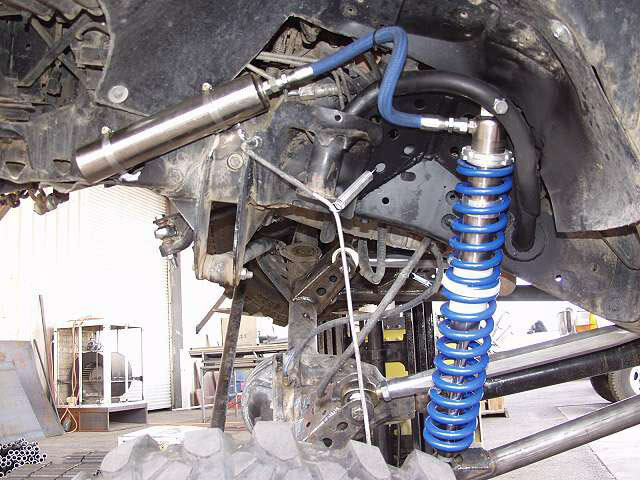 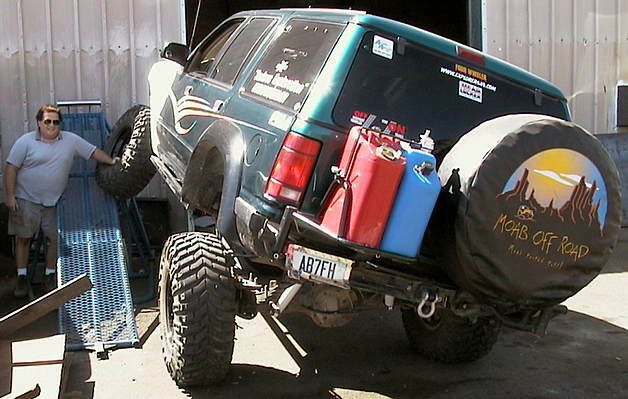 The coil springs are Explorer 4" lift springs from a Superlift. 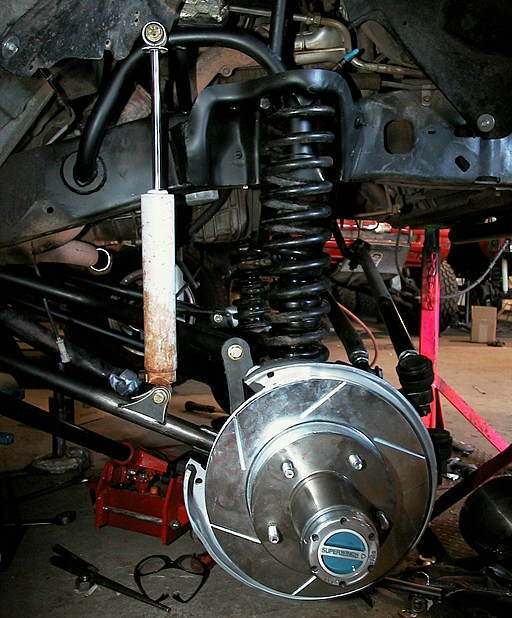 The suspension was designed so that the coil springs can fall away from the coil tower approximately 3.5" allowing more drop travel. 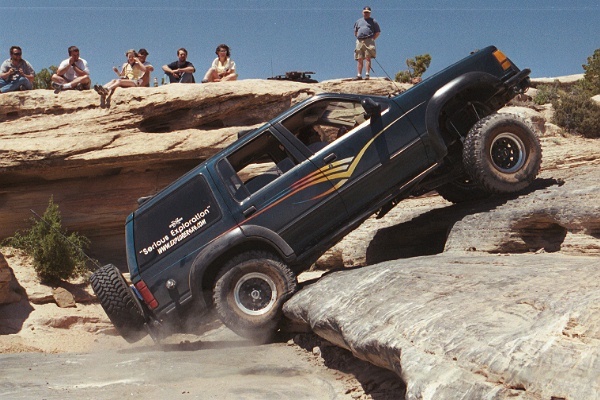 Even with this setup the truck can still take jumps and moguls in stride! 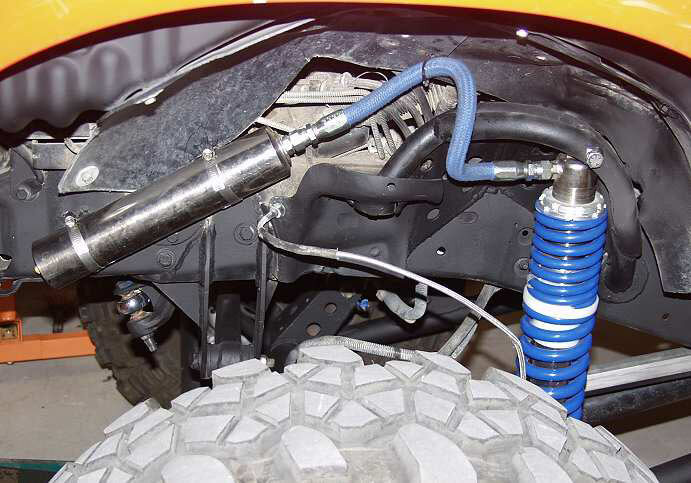 The custom hi-steer crossover steering system uses thick wall DOM Chromemoly tubing threaded for either large tie-rod ends or 3/4" heim joints depending on location in the system. 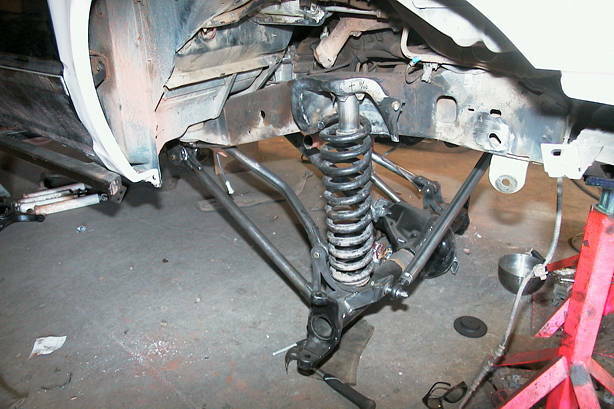 Each radius arm uses a heim joint for the rear of the top bar and a Johnny Joint for the rear of the lower bar. 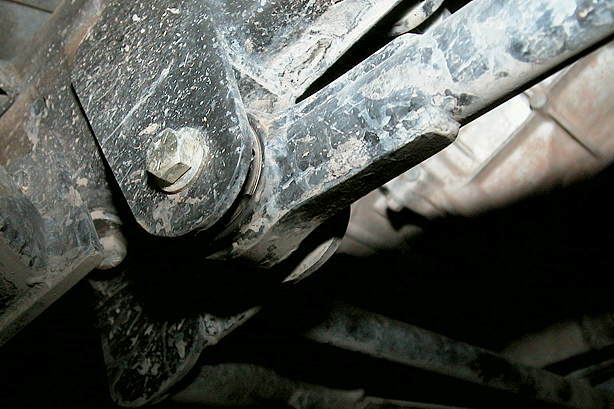 The front pivots use urethane bushings to keep vibration to a minimum. 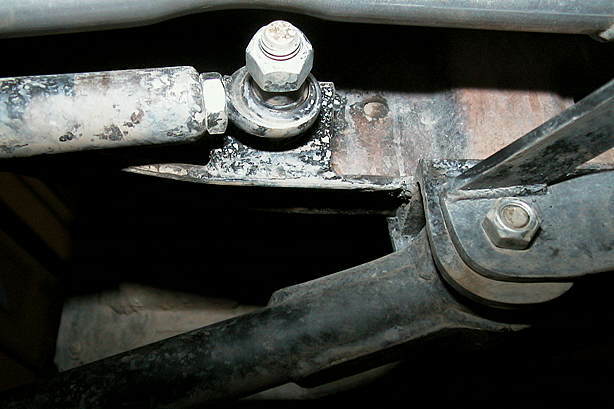 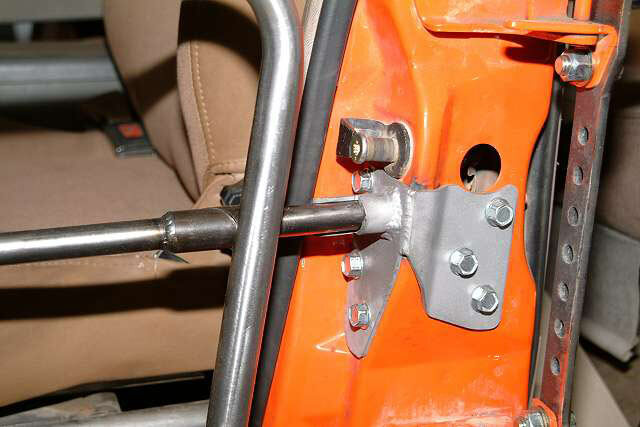 The track bar uses a urethane bushing on the end mounted to the frame and a 3/4" heim at the axle end. 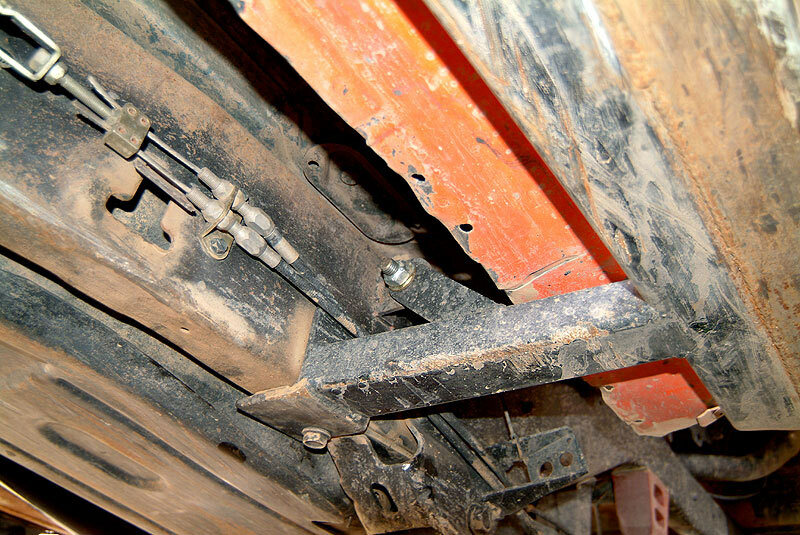 Rear leaf springs are from Dunbar Spring. 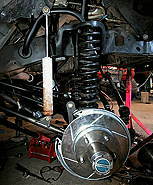 This pair was copied from a set of National springs originally built for an Explorer with a 5 -1/2" spring under axle lift so they had plenty of arch and 13 springs to the pack. 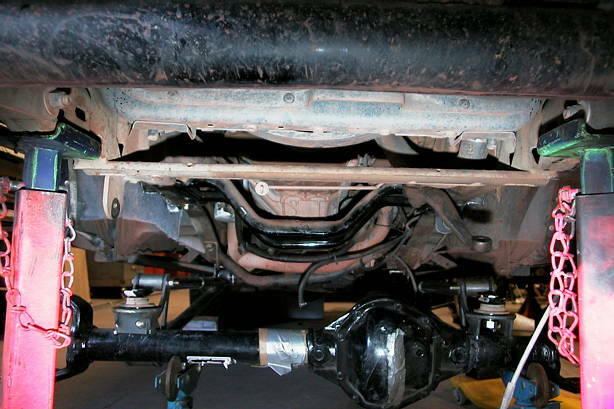 Since I use the springs above the axle, I had to remove three leafs to make the truck sit level. These Dunbar springs with their thin leaves flex like crazy. 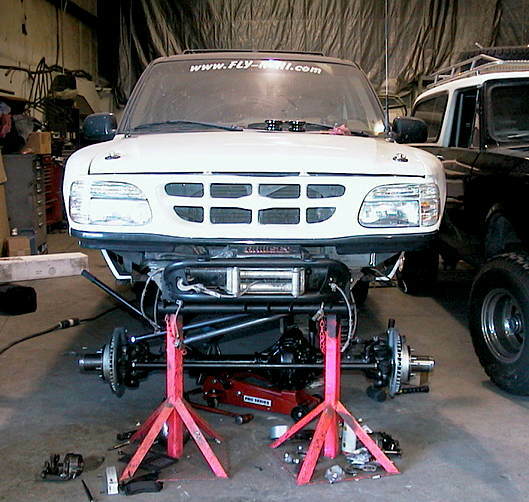 The truck now scores 1000+ on a 20 degree ramp..
Is this good for the springs??? 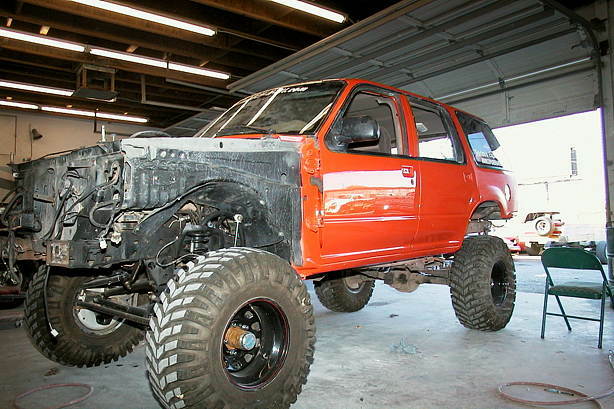 The team at FST took several months to craft and hone the finished product. 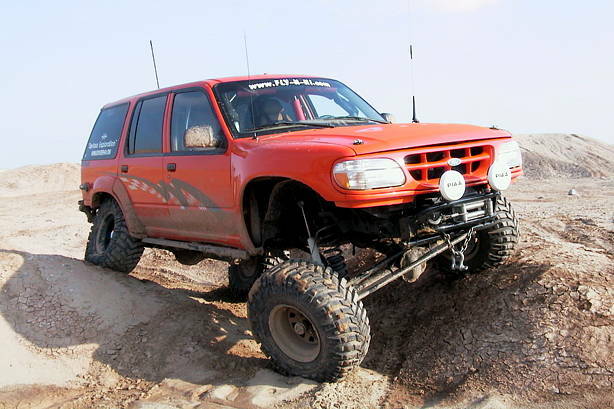 The end results have been superb with awesome handling and performance both offroad and on. 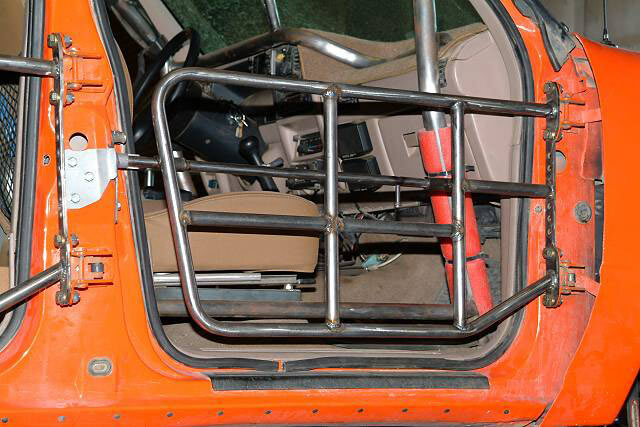 In order to gain better visibility and to help decrease the weight of the truck, FST built a set of half doors from tubular steel. 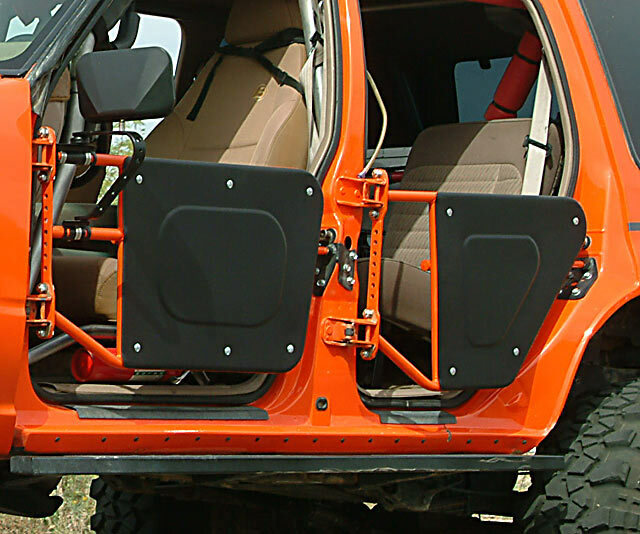 The doors were covered with aluminum sheet which is attached with Dzus quick release fasteners. 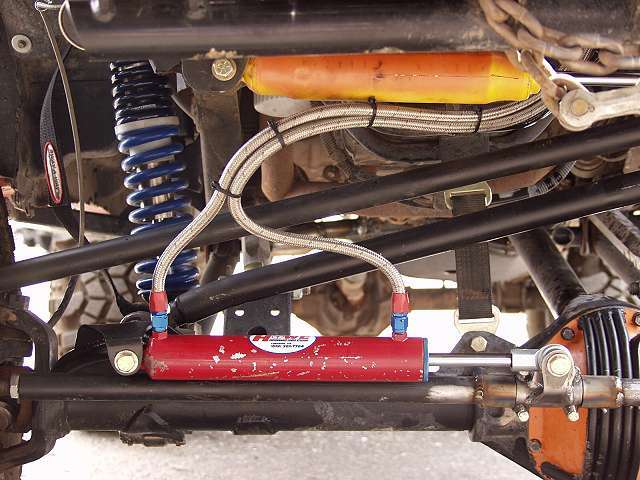 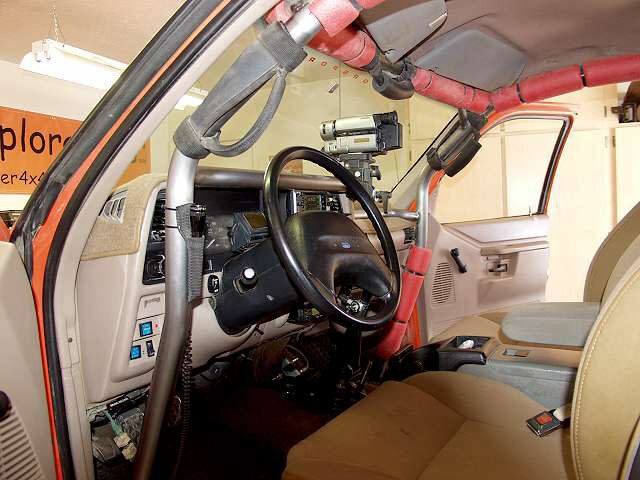 To decrease steering effort with the front ARB Airlocker engaged. 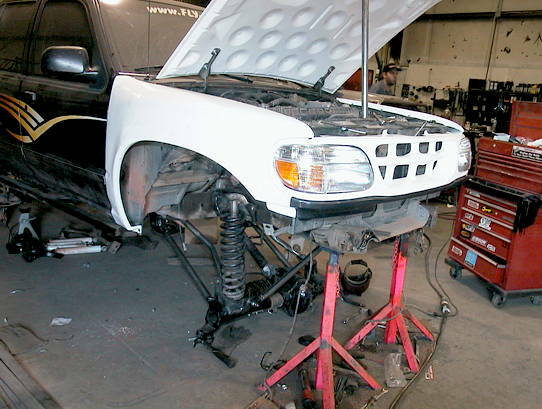 FST installed a Howe Hydraulic Ram to assist the power steering. 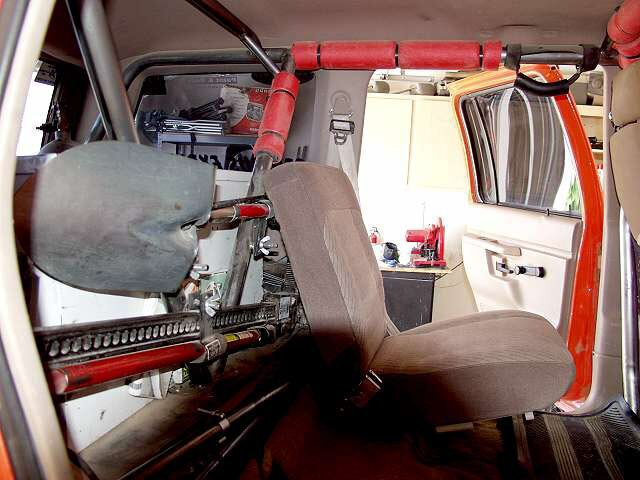 This setup works fantastic. 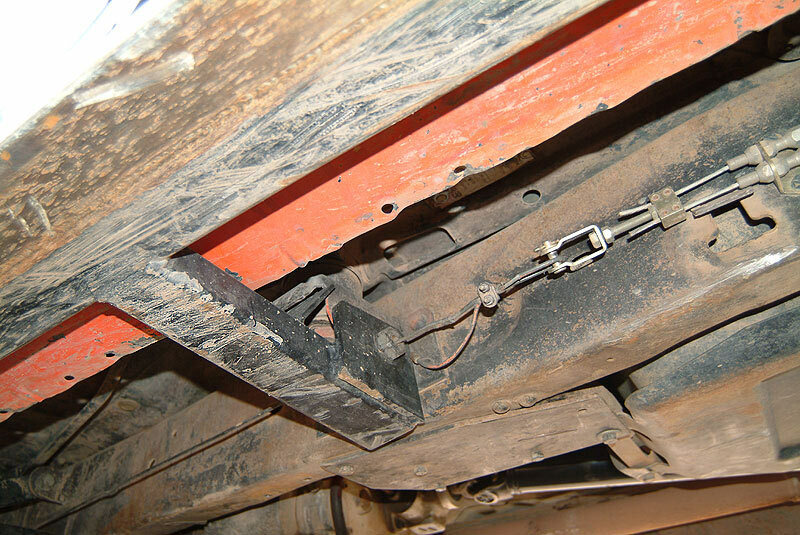 I can now turn the wheel lock to lock with the Airlocker engaged. 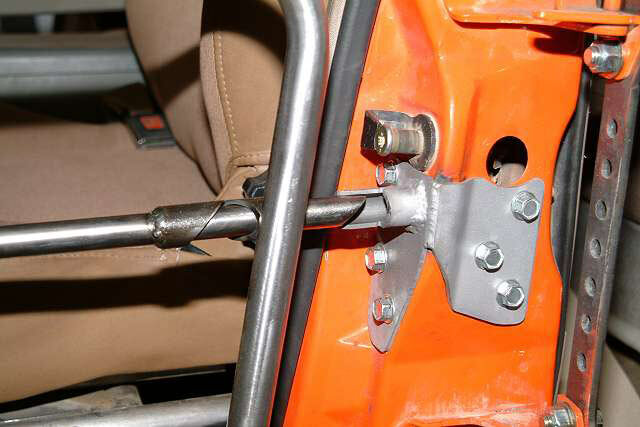 No more struggling to make a turn with the front end locked! 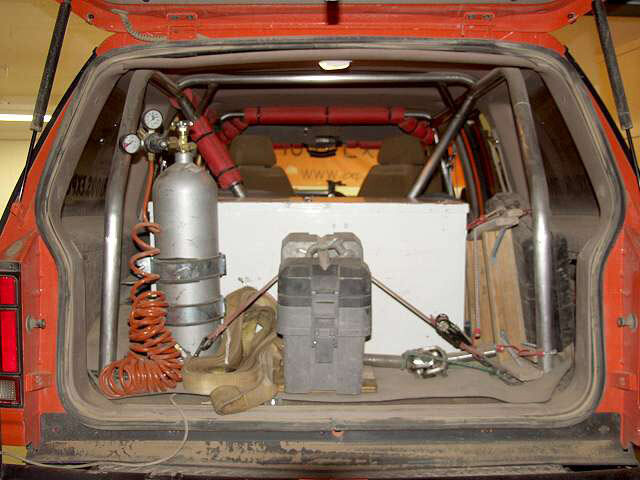 Additionally FST added a Howe power steering pump and cooler which complete the system. 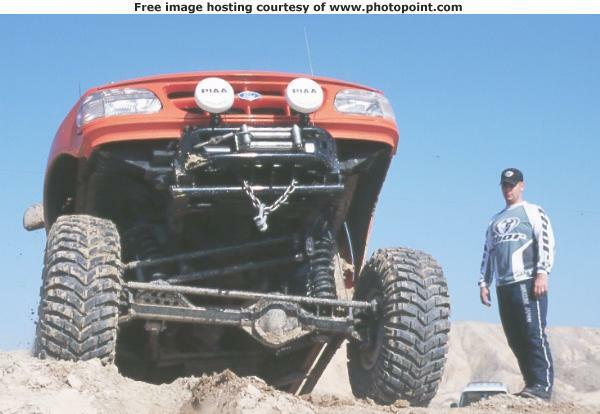 Dana 44 and Ford 8.8"